We’d love your help. Let us know what’s wrong with this preview of Workshift by Jason Morwick. 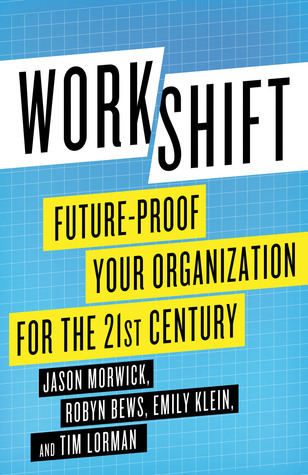 Through a stimulating blend of case studies, research, storytelling, and smart thinking, Workshift offers a never-before-documented road map for taking organizations from awareness to adoption. To ask other readers questions about Workshift, please sign up. This book was an incredible resource that also served as a workbook. It's packed with good advice that any professional would need to create cultural and environmental change in any setting where work gets done. The economy and the workplace is moving towards a mobile workforce as it allows the most freedom employees and serves as a benefit that many employees love. Having the ability to work from anywhere saves companies money but it can not and will not entirely replace face-to-face meetings. This book was an incredible resource that also served as a workbook. It's packed with good advice that any professional would need to create cultural and environmental change in any setting where work gets done. The economy and the workplace is moving towards a mobile workforce as it allows the most freedom employees and serves as a benefit that many employees love. Having the ability to work from anywhere saves companies money but it can not and will not entirely replace face-to-face meetings. This book is a great companion to the industrial psychology literature I use everyday. I recommend it for managers. HR staff, and innovative executives as a good read. A good discussion and evaluation of non-traditional business work space. It addresses both advantages and drawbacks of the system. The work looks at working in remote sites without a lot of office space. An interesting work system although it is unfeasible for certain business functions. This was a free review copy.